Nissan has unveiled the new face of its Taxi for London, re-designed to make it instantly recognisable as one of the capital's iconic black cabs. vision for the famous London Hackney Carriage in August 2012. In response to feedback from the London Mayor's office, Transport for London and other key organisations which have put their backing behind the new taxi, Nissan has redesigned the vehicle to better reflect the iconic nature of the traditional black cab. Nissan's newly-redesigned taxi has been developed for London, in London, by Nissan Design Europe (NDE) in Paddington, the same design centre responsible for the Qashqai and Juke. The new taxi will be launched in December 2014 with a modern, clean, 1.6-litre petrol engine equipped with an automatic gearbox. Furthermore, Nissan will launch a zero-emission electric version of the NV200 taxi in 2015. Nissan already has a rich pedigree in the London taxi market - its 2.7-litre TD27 diesel engine was fitted to the FX4 'Fairway' and TX1 black cabs during the 1980s and '90s and gained a reputation for reliability and durability. 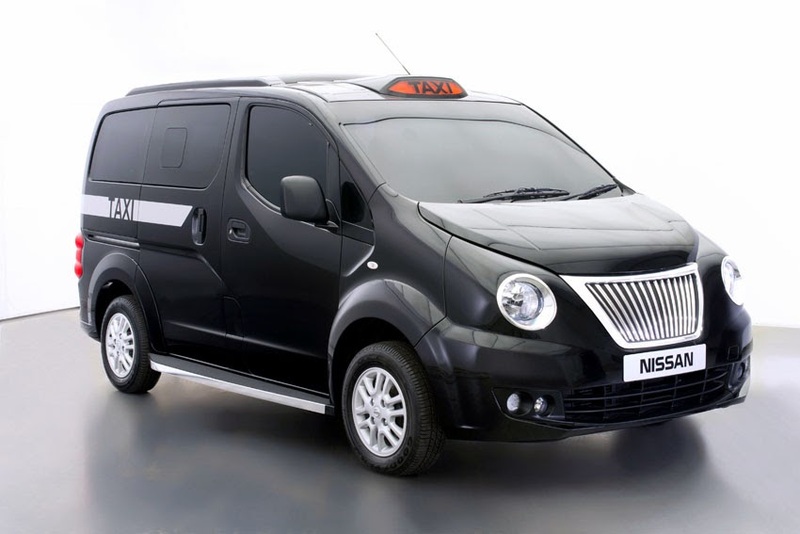 In developing the NV200 Taxi for London, Nissan has ensured that it adheres to the strict TfL regulations governing Hackney Carriages, including the required 25-ft (7.6 m) turning circle. The NV200 cab for London is part of Nissan's global taxi programme, which also encompasses New York, Barcelona and Tokyo. The London version's design is bespoke, reflecting the rich heritage and status of London's black cabs. "Having already overcome the unique technical challenges presented by the development of a new Hackney Carriage for London ahead of our launch of the vehicle in August 2012, we turned our attention to making the vehicle look the part," said Darryl Scriven, Design Excellence Manager at NDE. "The Mayor's office and taxi drivers were very keen that we maintain the character of the Hackney Carriage, making it something that people in the city can be proud of." "The main challenges were concerned with making sure customers can easily recognise it as a taxi. Being in London, we were able to go out and talk to cabbies about what was important to them as well as look at the vehicle from a customer's viewpoint. It's unusual for us to be able to work on something as bespoke as this, specifically for one location in the world and we are very proud to have been asked to do so." Andy Palmer, Chief Planning Officer and Executive Vice-President, Nissan Motor Corporation, said, "Since we launched our Taxi for London in August 2012, we have worked closely with the Mayor's office and associated stakeholders and interested parties to ensure that Nissan's new cab not only raises the bar for both driver and passenger, but is also as instantly-recognisable as its legendary forebears." "Alongside this, our engineers at Nissan Technical Centre Europe in Cranfield, Bedfordshire, have continued work on the cab, running real-world trials on the streets of London." Nissan intends to put the NV200 Taxi for London on sale in the Capital in December 2014. From launch the new taxi will be available with a 1.6-litre petrol engine equipped with an automatic gearbox. Compared to current diesel London taxis, this engine will be far cleaner, with lower levels of NOx and particulates. Nissan franchised dealer group, Glyn Hopkin, has been appointed as the exclusive retailer to sell the Nissan NV200 Taxi for London from a purpose-built, ultra-modern showroom facility based in Canary Wharf. Nissan is also forging ahead with its pioneering work in the sustainable motoring field, developing a 100 per cent electric taxi - the e-NV200 - which it aims to have on the streets of London years ahead of the Mayor's target of 2020 for the development of a zero-emissions taxi. Nissan's electric taxi will be on the streets of a UK city in 2015.